IKRAN S.r.l. 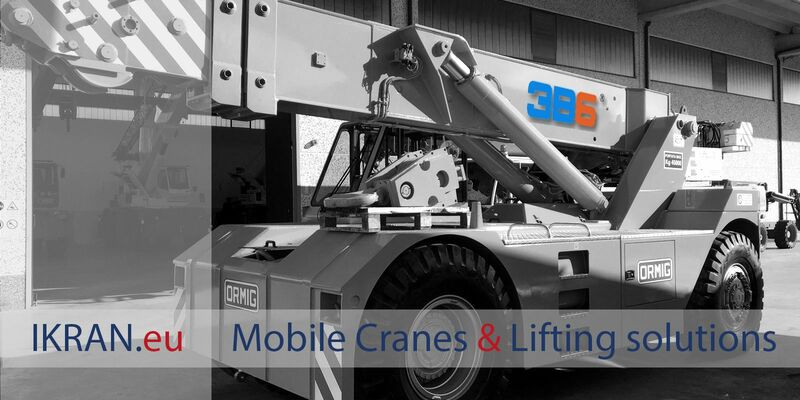 has a wide range of new machines for various areas of use, but it is especially authorised to sell Pick & Carry Cranes made by ORMIG, one of the most appreciated and reliable in the lifting and handling sector. IKRAN chooses ORMIG for its ability to produce vehicles characterised by high quality, cutting-edge technology and high-level performance, guarantees of safety and maximum efficiency for our customers. 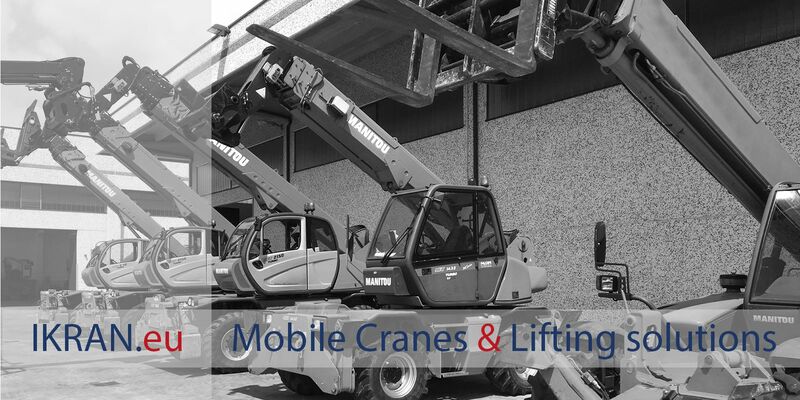 Whether it is the sale of Pick & Carry Cranes or the marketing of telescopic lifting machines, at IKRAN S.r.l. it is also possible to find first choice second-hand machinery, carefully selected by our team of experts. We turn only to trusted dealers and partners with which we boast consolidated partnerships over time, we are confident that we offer our clients safe, efficient and guaranteed second-hand industrial machinery thanks to an accurate checking and inspection service in compliance with the directives of the parent companies. IKRAN S.r.l. and Sì Parts S.r.l. allies for experience and leaders in the sale of spare parts and components. Being recognised all over the world for the high quality standard of the products offered, the B2B sale of the rich assortment of original spare parts and accessories for spare parts dealers, mechanical workshops, companies with machinery, allows us to satisfy the most demanding customers with the best offers on the market. An internal mechanical workshop and, also, a mobile workshop, provide the necessary assistance to your machinery to always deliver the vehicle in the best possible operating conditions. 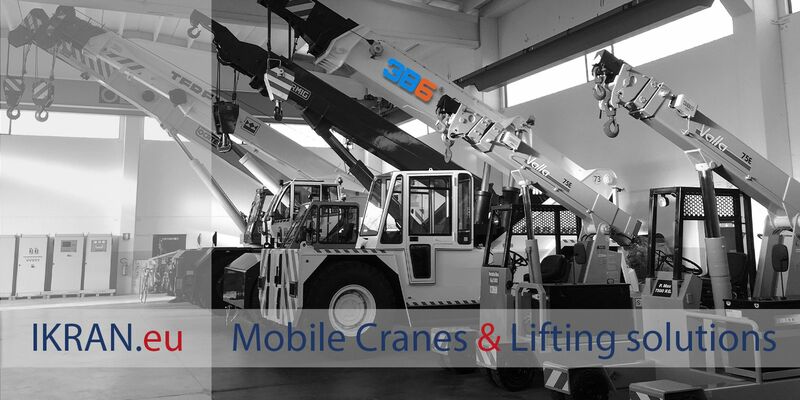 Our highly qualified and always up-to-date staff carries out the maintenance and repair of all types and brands of cranes and lifting solutions, as well as the various means offered for sale that is in stock. With over thirty years of experience and a team of professionals always in step with the times, IKRAN Srl is a real point of reference in the resale of mobile cranes, forklifts, telescopic lifting devices, self-erecting and tower cranes, bridge cranes. Many industrial sectors rely on the technical competence and consultancy skills of the IKRAN Srl team for the most various uses: lifting machines, building equipment, road construction means, industrial machinery and vehicles for agriculture. At IKRAN all this is available both new or first-choice second-hand, guaranteed by a staff of consultants and specialised technicians. Whatever is your request for machinery, vehicles and equipment, you will find a serious and reliable partner at IKRAN S.r.l., capable of a carrying out a global research all over the world in order to best meet your needs. in tutto il mondo per poter soddisfare al meglio le vostre esigenze. Off-road cranes - Mobile boom cranes on tyres - Crawler boom cranes - Recovery cranes - Port cranes - Pick & Carry Cranes - Fixed or rotary telescopic lifting devices - Forklifts - Self-erecting cranes - Tower cranes - Aerial platforms - Port forklifts - Bridge cranes. We select only the best bargains for our customers available on the international market to guarantee a wide range of vehicles and equipment of the best brands. Quality, safety and a respect for the environment complete a proven formula with over thirty years of experience and know-how at the service of the customer. Ours is a relationship based on mutual trust, cordiality and a professionalism that distinguish us and that are the emblem of a service that is at the highest levels of excellence. We strongly believe in the value of absolute quality that can be the means that makes your business grow by investing in safe, efficient and long-lasting machines. Each of our services wants to stand out for a maximum customisation, starting from searching the most suitable equipment for your specific needs up to providing the assistance services for a maintenance or even on-site repair works. IKRAN S.r.l. distributes vehicles, machinery and equipment all over the world. Every purchase involves a bureaucratic process that quite often becomes a great waste of time for our customers, especially if it does not possess human resources specialised in international trade. So our company runs to your rescue, providing a strategic operating service to allow any worries and inconveniences for you: we know the procedures to follow according to the regulations of different countries, so we can perform every operation connected to shipments, receptions, exceptional transports, permits, sea or or air authorisations, documentation for public institutes, customs and motorisations. The IKRAN team is also at your side for any need regarding the transfer of securities, the collection and transfer of funds. We follow every single sale with care and a meticulous attention to detail to ensure maximum satisfaction of our clients' needs. IKRAN S.r.l. operates with partners all over the world and sells its products to customers in any Country. Thanks to a strong international vocation, right from the beginning it set up a department in charge of optimising shipping times and the research and selection of the best solutions to send our goods safely. We are increasingly looking for faster and more affordable shipping means, knowing that long sea transfers are no longer acceptable by customers nowadays. So, this is our role: to seek the best services, the fastest and most reliable one among those available on the market, thus ensuring our customers timely communication in managing the transport of purchased equipment, also thanks to a thick network of partners and loyal contacts in over 100 countries worldwide.